The hotel offers excellent three star accommodation with beautiful single, double and twin rooms. The seventy delightfully decorated ensuite bedrooms come fitted with all facilities necessary for convenience and comfort including direct dial telephones, remote control televisions, hairdryers and trouser press. And 24hour room service is available. The highly trained staff will make sure that your stay is as comfortable as possible. The Peacock Restaurant offers a carvery lunch daily from 12 noon to 3 PM and a-la-carte dinner from 5.30 PM to 9.30 PM and all dishes are prepared by top class chefs using the freshest of ingredients and beautifully presented. The renowned Saints and Scholars bar featuring a beautiful teak and mahogany bar is loved by both visitors and Dubliners alike. The traditional friendly atmosphere and the caint and the craic make this an excellent bar to sit back and enjoy the drop of the gargle and relax. 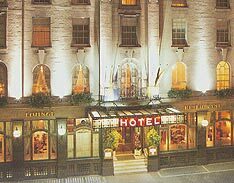 Wynns is located on the corner of Lower Abbey Street and O'Connell Street in the heart of Dublin’s City Centre. Grafton Street, Trinity College, St Stephens Green, Dail Eireann, The National Concert Hall, The Natural History Museum and The National Gallery are all close at hand. Temple Bar with its laid back bohemian atmosphere, cobblestone streets and sizzling night life is just a short walk from the hotel.